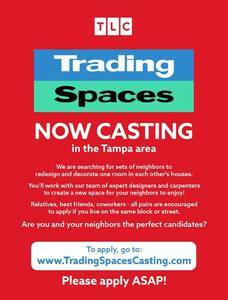 TAMPA, Fla. — "Trading Spaces" is back after being away for 10 years — and looking for Tampa area homeowners to be on the show. The popular TLC show, which originally aired between 2000 and 2008, invites neighbors to redesign and decorate one room in each other's houses with a $2,000 budget per room and help from professional designers. The catch — neither neighbor will have any input in the design process. RELATED: Trading Spaces is Back! To be part of the show, Tampa area neighbors must live no further than 1/4 mile away from each other, "but next-door neighbors are even better," according to TLC's casting website . Participants must have a room in their home they are willing to have renovated/decorated at the discretion of the designer assigned to their space. Participants must be residents of the home they wish to trade. Participants must own the home they wish to trade. Teams must live no further than 1/4 mile from one another, with preference to those that live next door to one another. All applicants must pass an extensive background check to be considered for the show. Those interested in having some fun and being on the show should apply at www.tradingspacescasting.com .